No, the site hasn’t sunk, however, I have run out of Mystery Ship photos. Thus, there will be a slight change. I will be posting photos of known ships with the name obscured. Once someone identifies the ship, the answer, as always, will be posted. 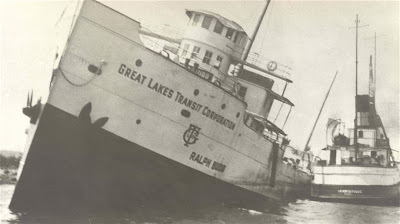 As for the photo above, it was taken in 1929 when the Ralph Budd was stranded on the rocks of Saltese Point six miles west of Eagle Harbor in Lake Superior. All crew members were rescued. The Great Lakes Transit Corp. also owned the Octorara,one of three former passenger ships, whose bell is housed at the Dossin Museum,and is also used yearly at the Mariner's Church ceremony when it is rung not only for the sailors who perished on the Edmund Fitzgerald, but for all mariners who have passed away in the year.